Figure 1. 3D render of the characteristic double helix structure of DNA. Although genes can now be easily identified and sequenced, knowledge of how nucleus structure affects gene regulation remain incomplete. 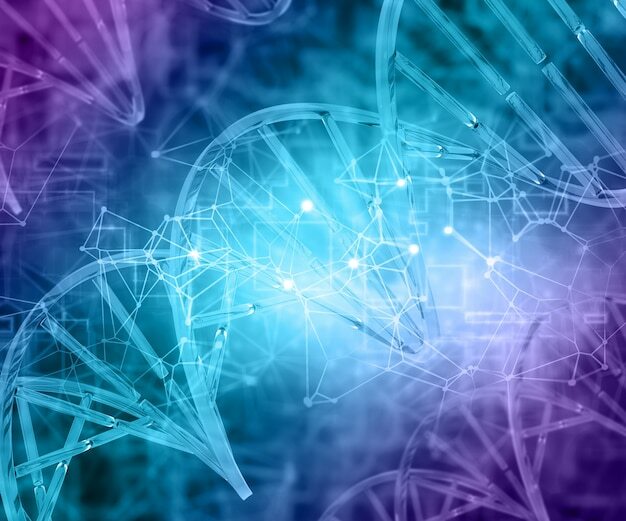 Rapid growth of DNA sequencing technology in recent years has led to a wealth of data and the ability to easily identify genes and regulatory regions. However, our understanding of gene expression control, especially through long distances of several kilobases or megabases, remains limited. As a result, the 4D Nucleome Project, an ongoing research initiative funded by the National Institutes of Health (NIH), seeks to gain insight into the functions and mechanisms of the structure of the nucleus. Because structural alterations and spatial folding of chromatin are known to have a multitude of effects on gene expression, mapping these physical changes to specific regulatory regions can potentially relay new information about the methods of long distance control of genes. The project focuses on the use of chromosome conformation capture techniques, also known as 3C methods, which analyze the spatial organization of chromatin. Afterwards, CRISPR-Cas9 techniques are used to alter DNA elements associated with changes in chromatin structures, such as chromatin loops and histone-modifying enzymes. CRISPR-Cas9 is currently the most versatile and precise gene editing technology available, and utilizes two key molecules: a guide RNA that first detects a specific site within the genome, and a Cas9 enzyme that cuts the DNA at that targeted site. This results in the activation of the cell’s DNA repair machinery, which can be altered so that it introduces mutations into the gene. After inducing mutations via CRISPR-Cas9, 3C methods can be employed again to these cells. A comparison of differences in the 3C method results between mutated cells and original cells can then reveal if mutations in specific regions affect chromatin spatial organization. By using these methods, this ongoing project strives to better understand the relationship between nucleus structure and overall regulation of gene expression.